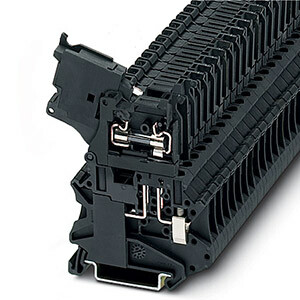 The XBUT-F screw connection fuse terminal blocks perform two functions. They act as a fuse carrier for most common North American and European fuses and they allow for potential distribution with the double bridge shaft. The terminal blocks therefore allow bypass routing of two separate potentials next to each other. This has the advantage of a time-saving potential infeed and a correct, functional configuration of the terminal strip. For signaling a triggered fuse, fuse terminal blocks with light indicators are available (for both AC and DC voltage).